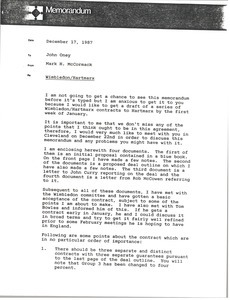 4 results found for: genres:"Contracts"
McCormack agrees with Kinnings' suggested language for the attached draft agreement between Dentsu and the Toyota World Match Play Championship. 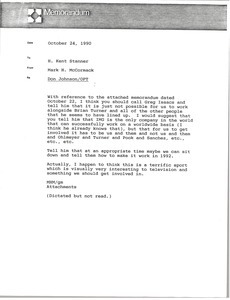 Concerning the attached material regarding Don Johnson and OPT, McCormack asks Stanner to call Greg Isaacs and tell him that IMG cannot work alongside Brian Turner and "all the other people that he seems to have lined up." 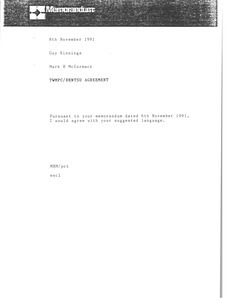 Attached is a draft of a contract between Offshore Professional Tour, Inc. (OPT) and an unspecified company. Cleveland (Ohio) - Letter to Paul W. Critchlow discussing Raymond (Ray) Floyd and attached is a proposed affiliation between Floyd and Merrill Lynch. The attached proposal goes into detail about suggested services and terms for the Merrill Lynch and Ray Floyd affiliation. This attachment also includes background information on Ray Floyd.